Security forces detain a protesting teacher during a demonstration in Rabat, Morocco, Feb. 20, 2019. Credit: Associated Press. Several demonstrations were held Wednesday in Morocco, marking exactly eight years after the birth of the Arab Spring movement there that awakened a spirit of activism in the North African kingdom. 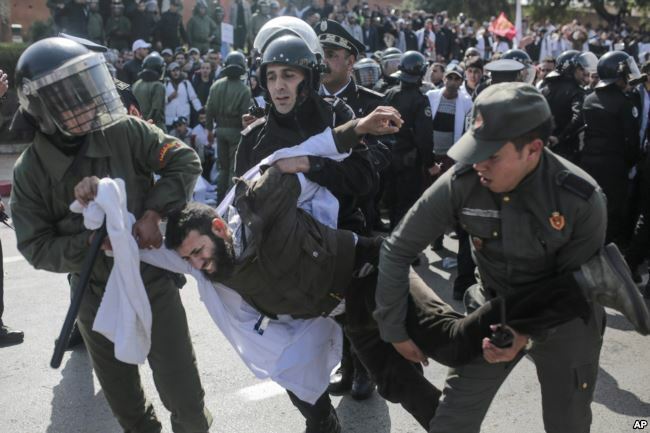 Moroccan police fired water cannons at protesting teachers and beat people with truncheons amid demonstrations around the capital city of Rabat. Participants in the movement recalled how the Arab Spring had changed them, even as Wednesday’s protests sharpened fears that authorities were losing patience with the dozens of protests now held across Morocco every day. Thanks to the youth movement, “Moroccans have developed self-confidence to demand their rights using all legitimate means. February 20 is a spirit that lives on to this day,” said Mostapha Mochtari, a member of an Islamist party who was in the forefront of the 2011 protests. On Friday, Algeria saw its largest protests ever when the population converged in the streets to oppose ailing president Abdelaziz Boutfleika after he announced that he would be running for a fifth term. Calling for the downfall of the regime, protesters echoed the slogans of the Arab Spring. The 81-year old has been in power for 20 years and his party declared earlier this month that he would continue on for another five-year term in elections scheduled for April. Political talk has been swirling for years about who will succeed Bouteflika since his health deteriorated after a stroke in 2013 confining him to a wheelchair. He has rarely been seen in public in recent years. Protests are extremely rare as they have officially been banned since 2001. 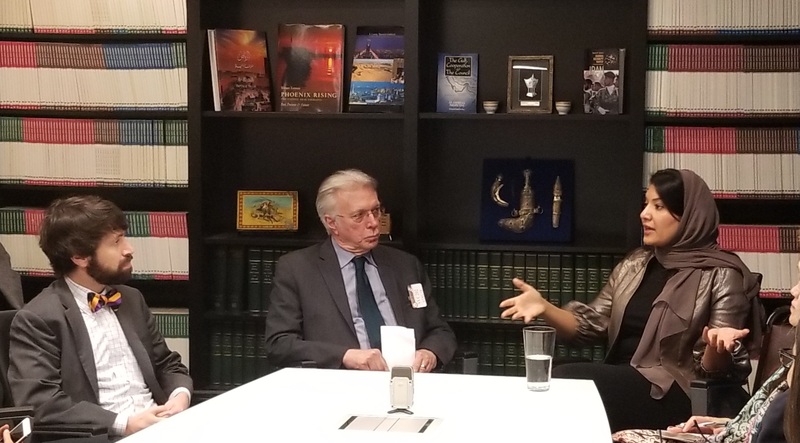 Princess Reema bint Bandar bin Sultan, named as Saudi Arabia’s first woman ambassador to the United States, speaks with audience members at the Middle East Policy Council in 2018. Saudi Arabia appointed its first female to serve as an ambassador for the kingdom Saturday, naming Princess Reema bint Bandar Al Saud to be ambassador to the United States. The princess, a member of the Saudi royal family, has been an advocate for women’s rights in the kingdom and widely seen as a rising political star in the country. She will replace Crown Prince Mohammed bin Salman’s younger brother, Prince Khalid bin Salman bin Abdulaziz. Princess Reema’s father, Bandar bin Sultan al Saud, was Saudi’s ambassador to the United States from 1983 to 2005. She attended George Washington University and currently works with the Saudi General Sports Authority to promote women in sports in the kingdom through initiatives focused on inclusion and encouraging more active lifestyles. While talks aimed at resolving the civil war in Afghanistan commenced on Sunday, a United Nations report revealed that nearly 4,000 civilians were killed in the conflict in 2018, making it the single deadliest year for Afghan civilians since the UN began documenting casualties 10 years ago. 63% of civilian casualties were attributed to insurgent groups, primarily the Taliban and the Islamic State. Afghan and American forces were responsible for 24% — 14 percent by Afghan national security forces, 6 percent by American forces and 4 percent by government-backed armed groups. The figures reflected a surge in fighting as both sides in the conflict, which is in its 18th year, stepped up attacks as they sought leverage in peace talks between the United States and the Taliban. The single biggest cause of civilian casualties was suicide bombings and related attacks by insurgents, the report found.